Trego County-Lemke Memorial Hospital is a 25-bed critical access health care facility providing inpatient, emergency and outpatient services. Our Home Health Agency serves Ellis, Gove, Graham, Ness and Trego Counties. WaKeeney and Ellis Family Care Centers offer clinic services aimed to fulfill all of your family’s needs. An attached 37-bed Long Term Care unit, 6-bed Assisted Living complex, and Home Delivered Meals complete the package by providing all aspects of care under one roof. Our strength comes from the commitment and genuine caring of our healthcare team and the support of our community. Our vision of “To be the healthcare facility of choice for our community and surrounding area” serves as our guiding principle. We welcome your comments. Trego County Lemke Memorial Hospital (TCLMH) was recently named one of the Top 100 Critical Access Hospitals in the United States. Each year, the rural hospitals are analyzed through the lens of the Hospital Strength INDEX, the industry’s most comprehensive and objective assessment of rural hospital performance in the United States. The top performing Critical Access Hospitals are recognized for excelling in managing risk, achieving higher quality, securing better outcomes, increasing patient satisfaction, and operating at a lower cost than their peers. This achievement is very appreciated and validates the daily commitment and dedication of all the employees of TCLMH and the strong support of the community. The list of the Top 100 Critical Access Hospitals can be found by clicking on the picture. There are 5 Kansas hospitals included in top 100 list of Critical Access Hospitals in the United States. 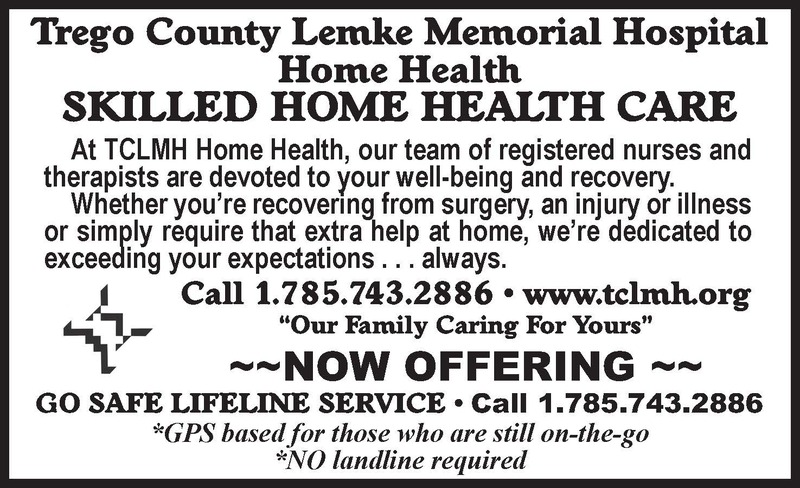 Trego County Lemke Memorial Hospital’s Senior Life Solutions program, an intensive outpatient group counseling program, is designed to meet the unique needs of older adults over the age of 65 struggling with symptoms of depression and anxiety often related to aging. 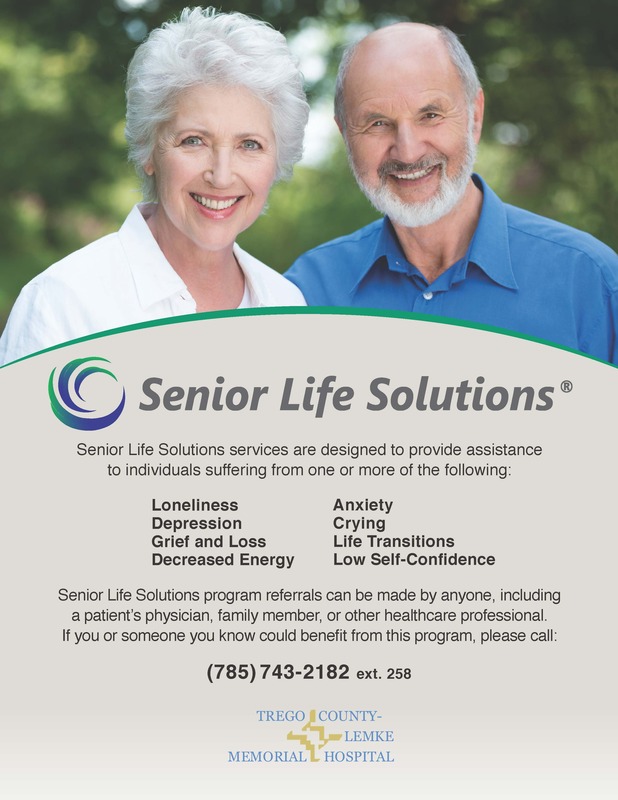 For more information about Senior Life Solutions, call 785-743-2182. 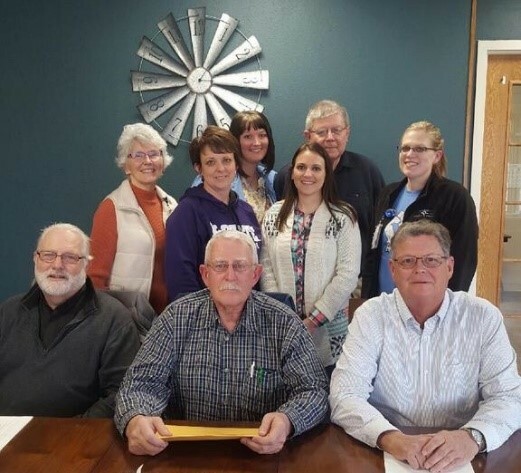 In an effort to continue improving its quality of care, Trego County Lemke Memorial Hospital completed its first orientation for volunteers from our area community to serve as advisors on a new Patient and Family Advisory Council (PFAC) in January 2019. 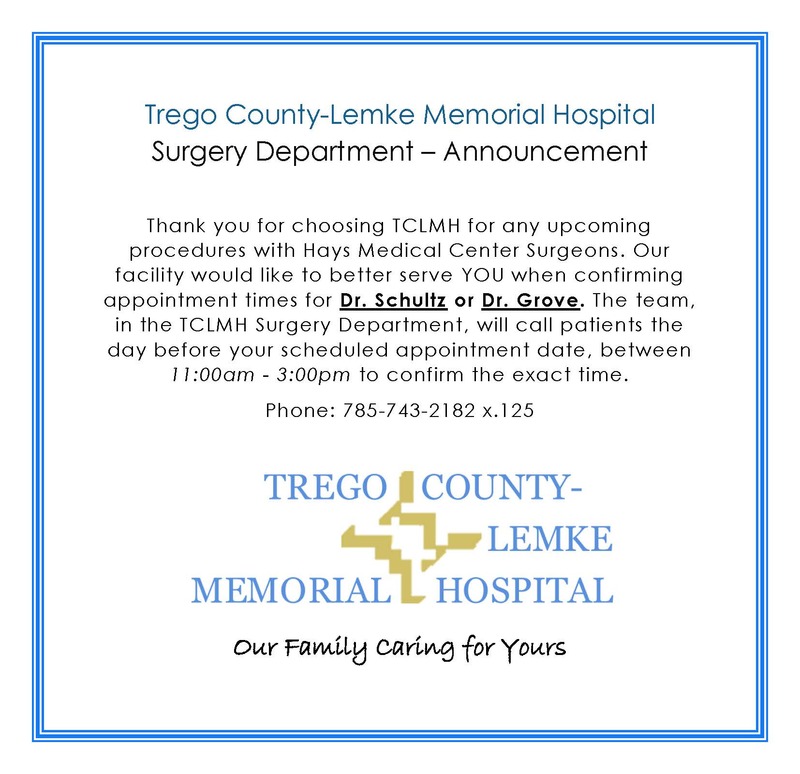 According to Tracey Schoenberger, BSN, RN, the council will bring together patients and families with health care staff to discuss and provide guidance on how to improve the patient and family experience at Trego County Lemke Memorial Hospital and its clinics, WaKeeney/Ellis Family Care Clinics. Community advisors will be asked to serve on the council alongside health care staff to ensure multiple perspectives and experiences are both heard and integrated into improving the quality of care. Examples of what advisors could do include: identify local patient and family health care needs; discuss new ideas on how to improve quality of care; provide feedback on current processes at the hospital and clinics; promote awareness of opportunities and key health care resources to the community; generate ideas for programs and/or education to benefit patients, family members and caregivers; enhance ongoing collaboration and cooperation among health care providers, patients and families; and participate in the development and planning of items such as patient and family satisfaction initiatives as well as facility renovation. What is Walk-In Clinic and When Should You Use It? Life threatening emergencies, such as a heart attack or a serious head injury, require a visit to the Emergency Department (also most commonly referred to as the Emergency Room (ER) at the hospital). When faced with a medical problem that necessitates care, it is often hard to assess if it is truly an emergency. Here are some guidelines to use to help you determine what is the best location for you to receive proper treatment. Trego County Lemke Memorial Hospital is pleased to announce the WaKeeney & Ellis Family Care Centers will have Walk-In-Clinics starting on September 22nd. 8:30 am — 2:00 pm. TCLMH's mission is "Touching lives with compassion and a commitment to excellence." One way that we measure how well we are meeting this mission is by the input our customers give us. If you have a great experience we want to hear about it. Hearing about the services and staff that you enjoyed the most, helps us to recognize and reward our team. If we fell short of your expectations, we want to hear about it. Bill Gates once said, "Your most unhappy customers are your greatest source of learning." At TCLMH, we are committed to receiving customer concerns and viewing them as ideas for growth and improvement. For example in 2011, our parking spaces were widened to enable our customers to access our facility with ease; and a wall mirror was placed in the Acute hallway after a customer voiced their concern about potential collisions at the intersection. After you receive services at TCLMH and our Family Care Clinics in WaKeeney and Ellis, please take a moment to fill out your patient satisfaction survey. Each visit can provide a new experience for our customers, and we want to hear about it!